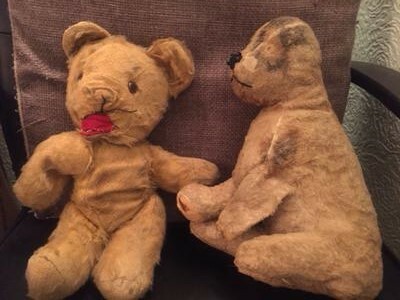 I was given these 2 bears when I was about 10 days old, having flown from Bahrain to UK to meet my grandparents. These teddy bears were given to me by my grandparents as a "welcome to the world" present. The Tedy Bear is a yellow Deans Bear, with arms and legs that move, a red felt nose (which has been restitched) and is quite thin in places. I believe it is straw filled. He was much loved and as a child had many accidents that required him to have plasters and bandages as one of my favourite games was playing nurse to the teddies. The other teddy bear is actually a dog and is a Chad Valley hygienic toy which is in need of restoration. He has lost his eyes, ear and tail and the one leg has lost his stuffing, you can clearly see that this dog is straw stuffed and a copper coloured straw. He has lost his ears etc but there is no damage to the actual dog, so they must have been attached externally. He's a mottled grey colour and well loved but in quite a sorry state. He was also much loved but I don't think he can have been as robustly made as the teddy because he has not survived as well. Both these bears were taken back to Bahrain and stayed there until 1982 when they came back to live in England. They currently live in a box in the loft. I am at an age when its time to get rid of my stuff so Do these 60 year old bears have any value or should i bin them?